Here we can see some citations that were never referenced, and there are others that became outmoded but were not removed as the authors revised the manuscript. There are errors, such as Heil (1999) vs. Heil & Reese (1999). FAA and Federal Aviation Administration may mean the same thing to the author, but only one format is appropriate. The program also catches minor variations, e.g., SAS Institute Inc. (1990) vs. SAS Institute (1990). The program does not determine which form is correct, nor does it make any modifications of the manuscript. The discrepancies report only calls differences to the author’s attention. 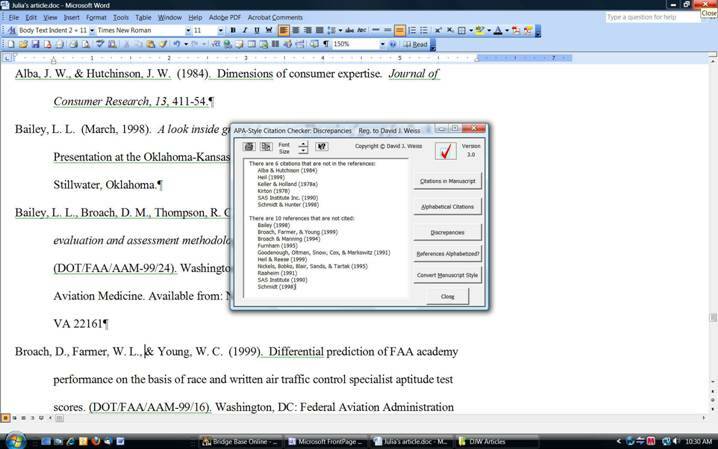 Citation Checker can determine whether the entries in the References section are properly alphabetized. While one might think that people who know enough to write scientific papers also know the alphabet, my personal experience has demonstrated that not to be the case. Citation Checker can generate two additional lists. Citations in Manuscript presents all of the citations in the order that they occur, along with the page number on which each citation is found. This is useful in making the corrections called for by the discrepancies report. The program also can provide an Alphabetical List of the citations, omitting duplicates. This list can be helpful to an author who prefers to assemble the reference list after writing the manuscript. There are many journals that do not follow APA style. The converter can change the manuscript to accommodate most styles, whether they are called Chicago, Vancouver, or Harvard. The program "reads" the manuscript, identifying citations and references, then changes the styles as dictated by the user's selections in the Module interface.